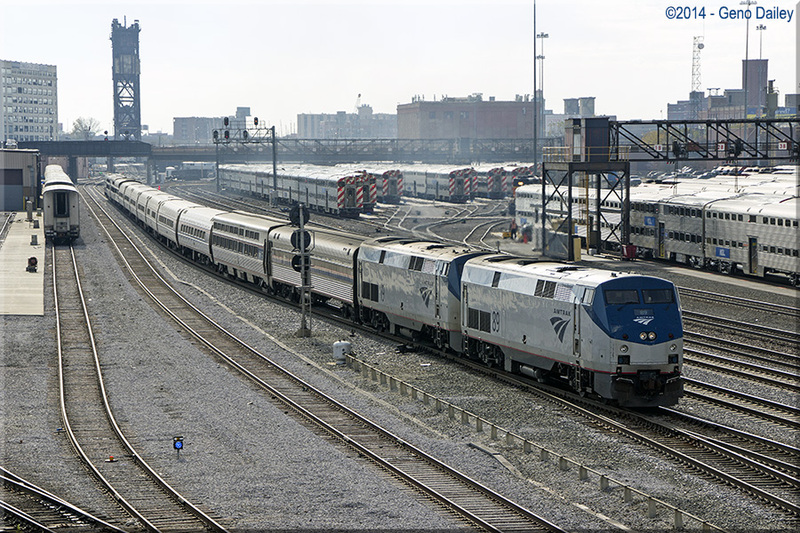 The first train I would see today was Amtrak's Lincoln Service Train #300 arriving shortly at Union Station, having originated earlier today in St. Louis, MO. 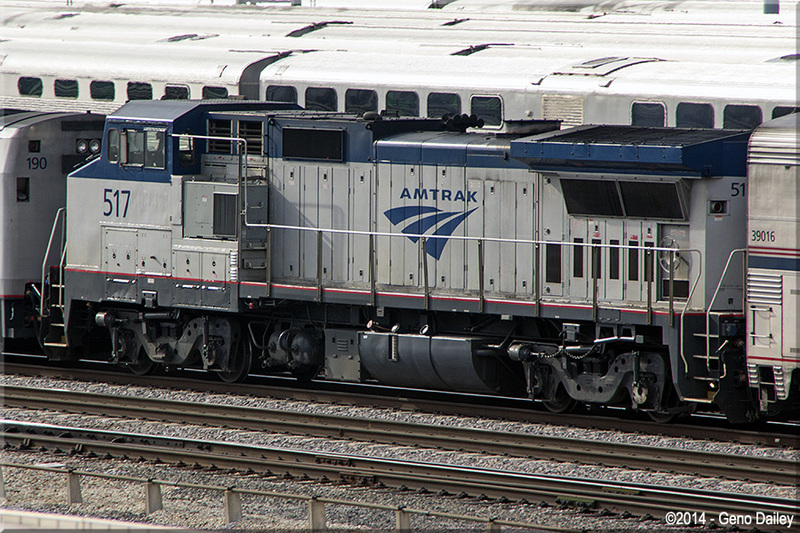 This train operates in push-pull mode and uses a P42 on each end. The train was moving away from me as I took this photo. 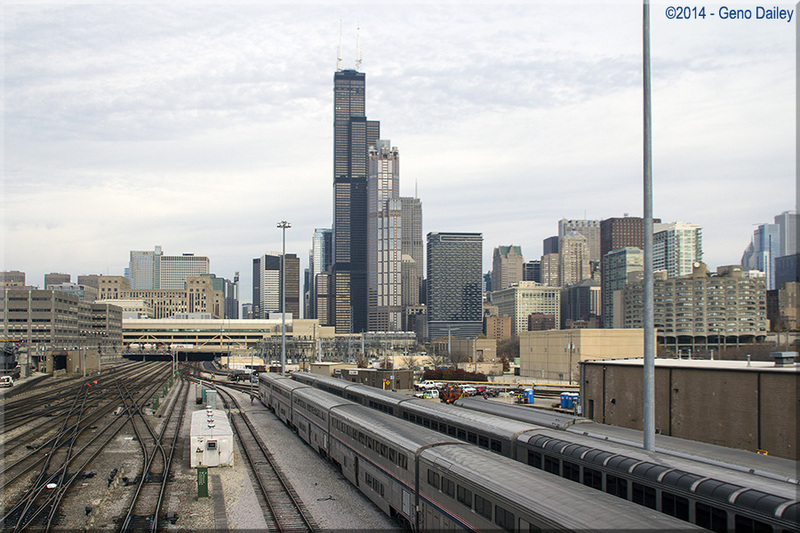 The mighty Willis Tower dominates the Chicago Skyline from here! 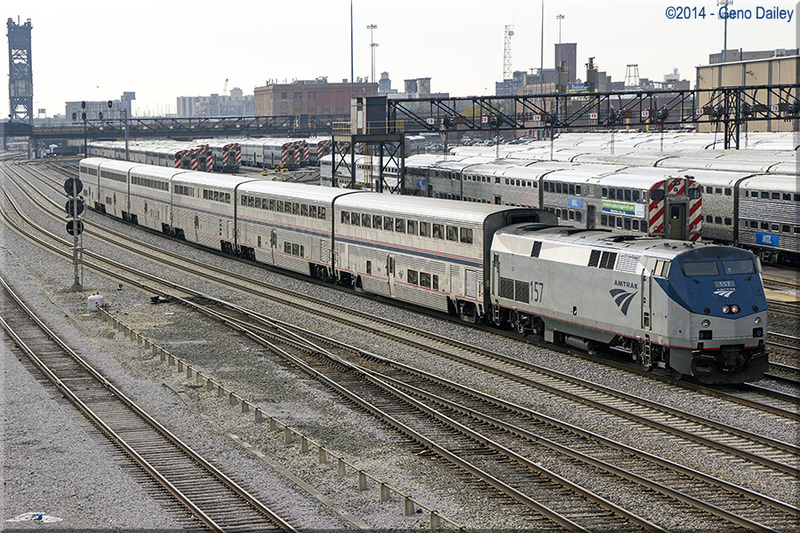 Amtrak's car shop at Chicago. Usually, a P32-8BWH will do most of the switching duties, moving cars in and out of the shop. backing up out of Union Station. It will be turned on the wye onto the BNSF then back into the yard for servicing so as to go back as today's Train #30. 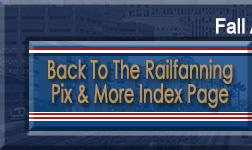 Another long-distance train being readied for a departure later today. 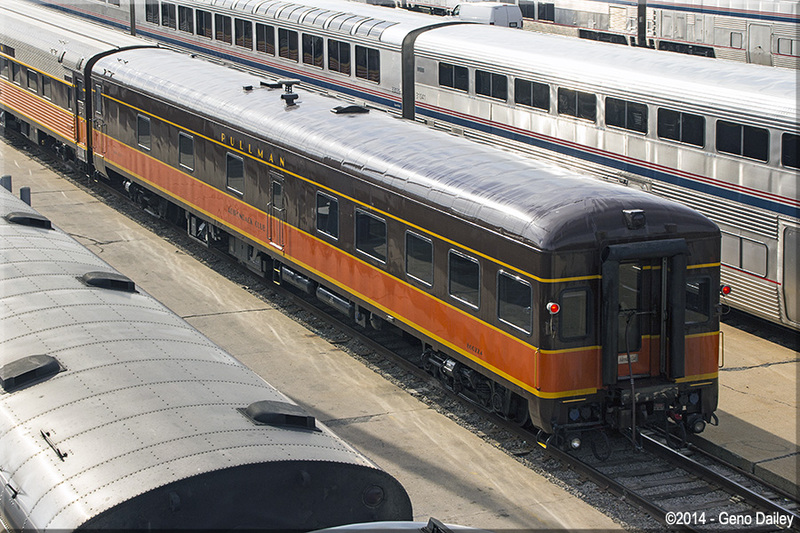 This train is either the Empire Builder or the California Zephyr. Hiding in the yard is one of the locomotives that generally does yard switching duties, this GE P32-8BWH #517. #10627 "Swift Stream". 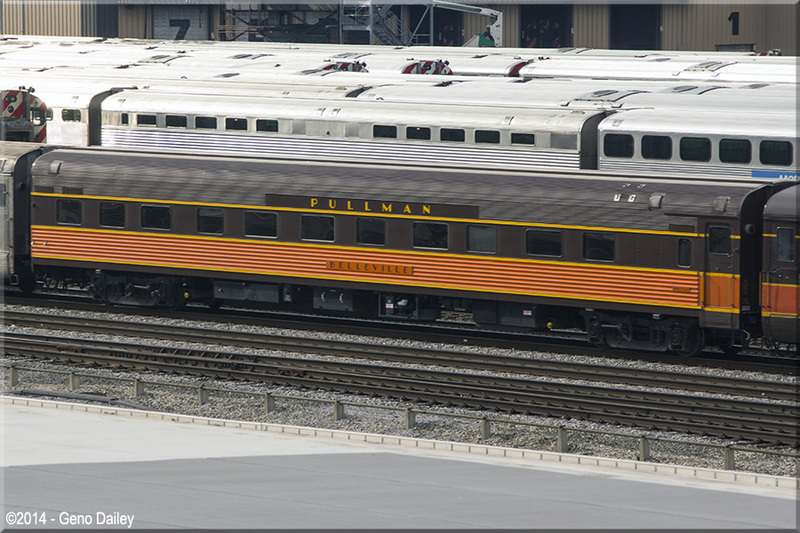 This car was built by Budd in 1949 and served on the New York Central, Penn Central, Amtrak, then into private ownership. 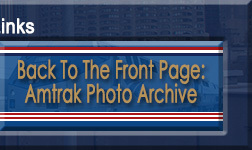 Special thanks goes to amtrakbythenumbers.com for historical info on this car. 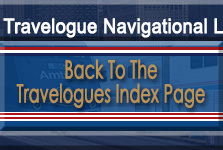 to Trainorders.com and amtrakbythenumbers.com for historical info. 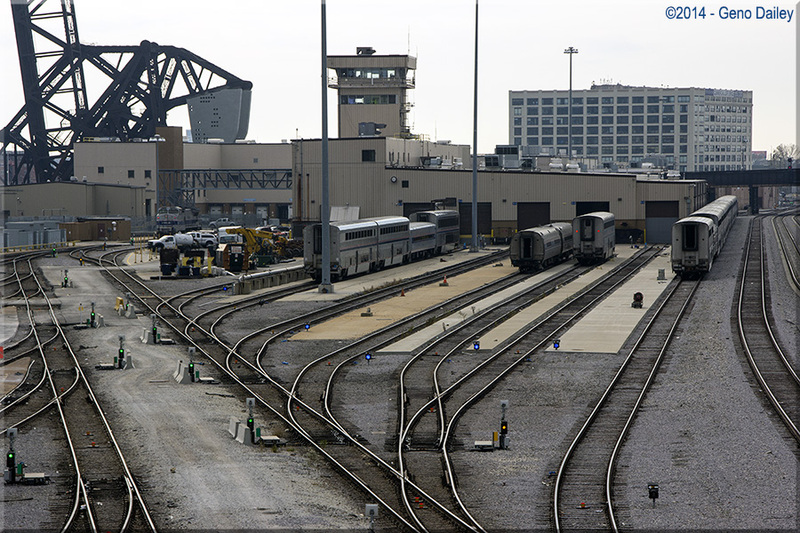 was also at the Chicago coach yards. 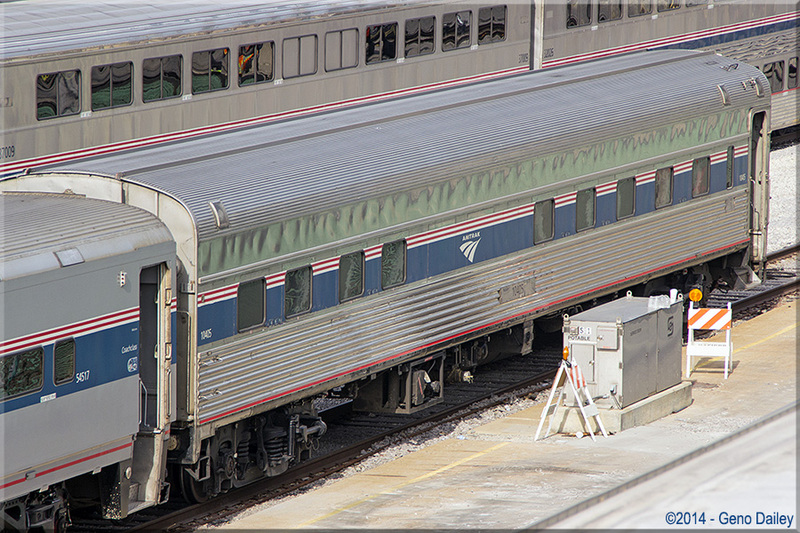 The car's original name under the C&O was "Blue Ridge Club". 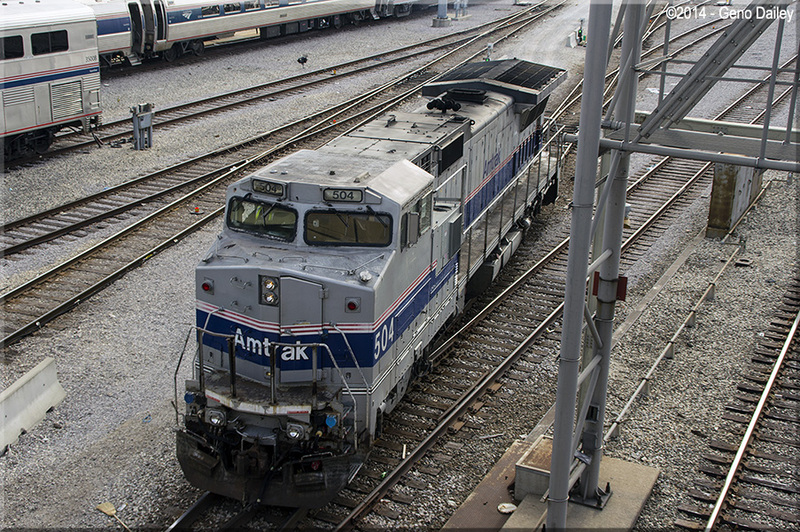 The car also operated on Amtrak for a time. 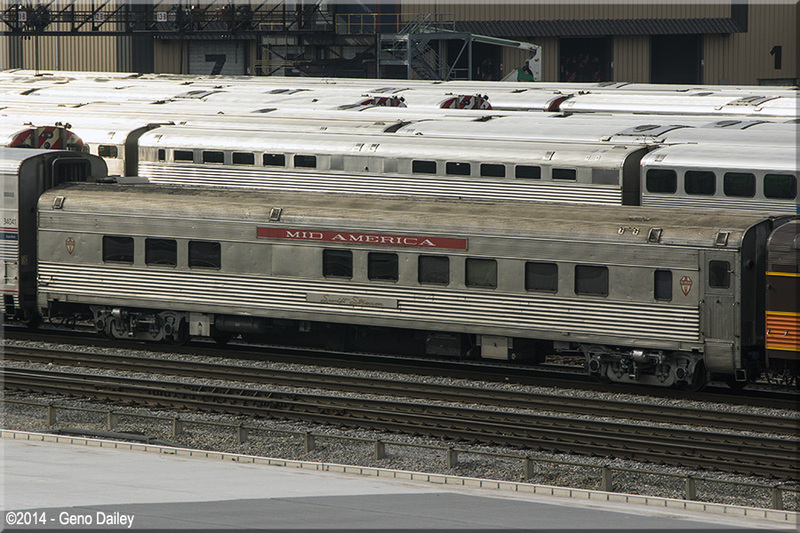 Special thanks for historical info on this car goes both to Trainorders.com & amtrakbythenumbers.com. 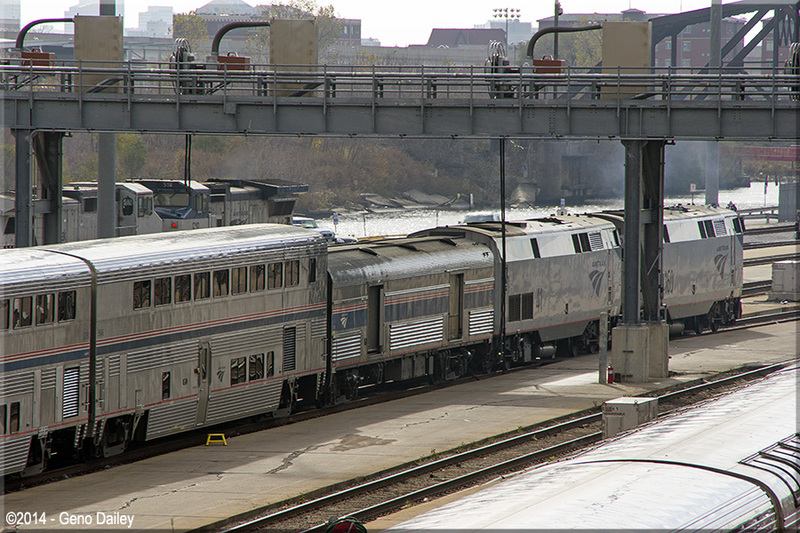 converted into a Buffer Car that is used when ferrying cars back and forth from Chcago to the Beech Grove heavy maintenance facility. 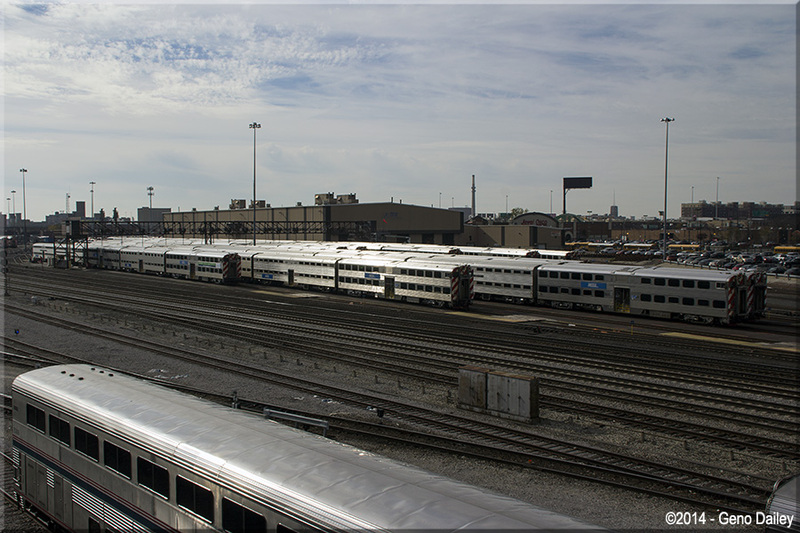 Of course, next to Amtrak's coach yard is the Metra Coach Yard, Metra is Chicago's commuter rail system. 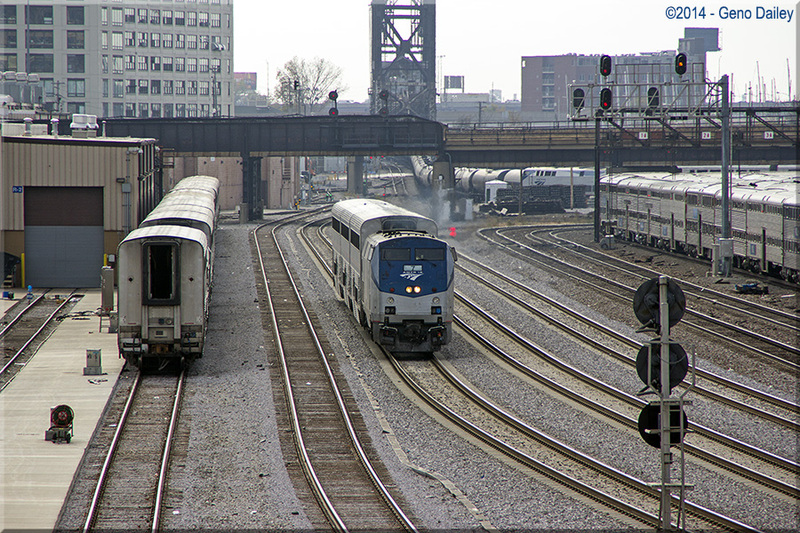 and the other end features a cab control car like what is seen in the above photo. track. The train was also ferrying some equipment from Beech Grove on the rear end. This photo was taken with an 18-200mm lens. 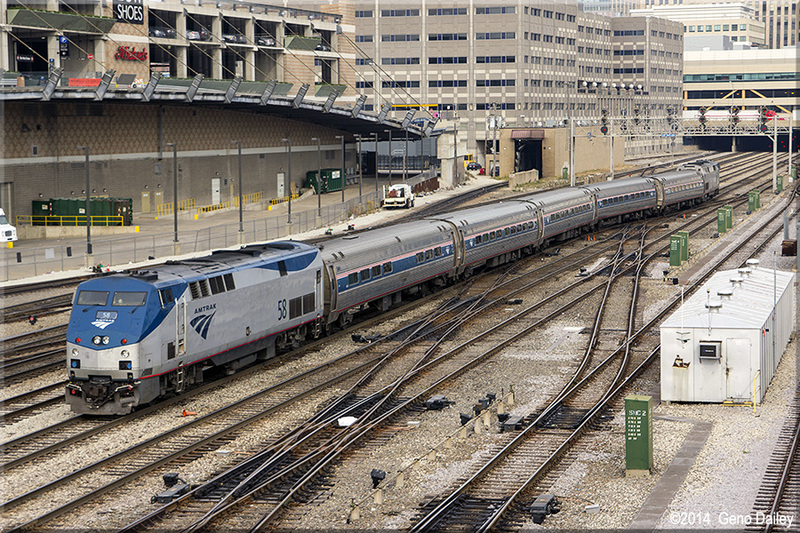 Amtrak GE P32-8BWH #504, still in Phase IV paint, does switching duties today. 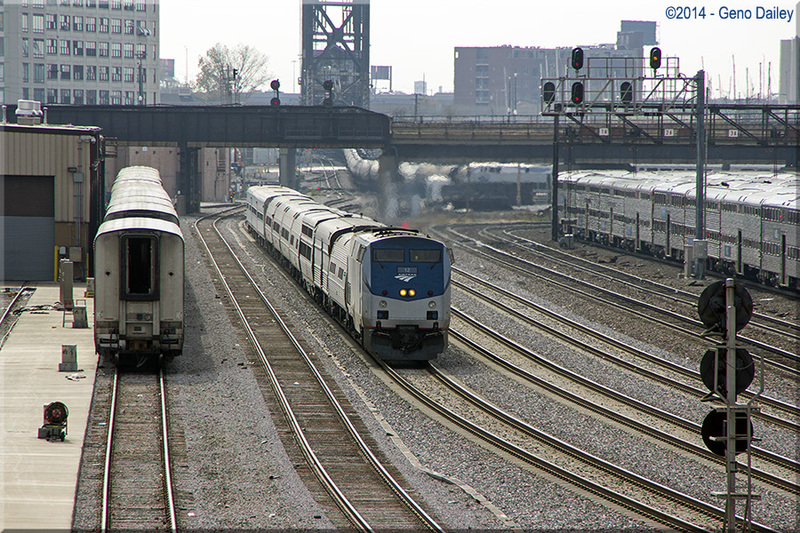 GE P42DC #7 leads Train #371 - The Pierre Marquette from Grand Rapids, MI, running past the coach yards. 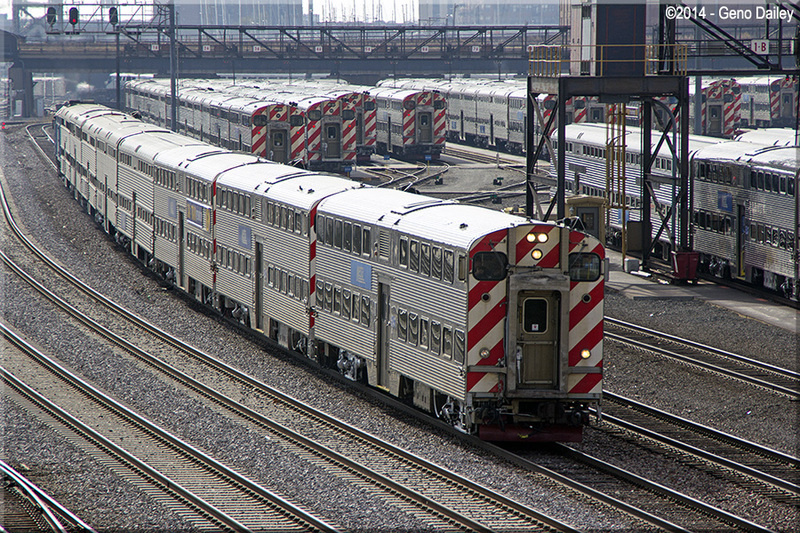 And now a train that I'm very familiar with, none other than Train #49 - The Lake Shore Limited now arriving in The Windy City!!! 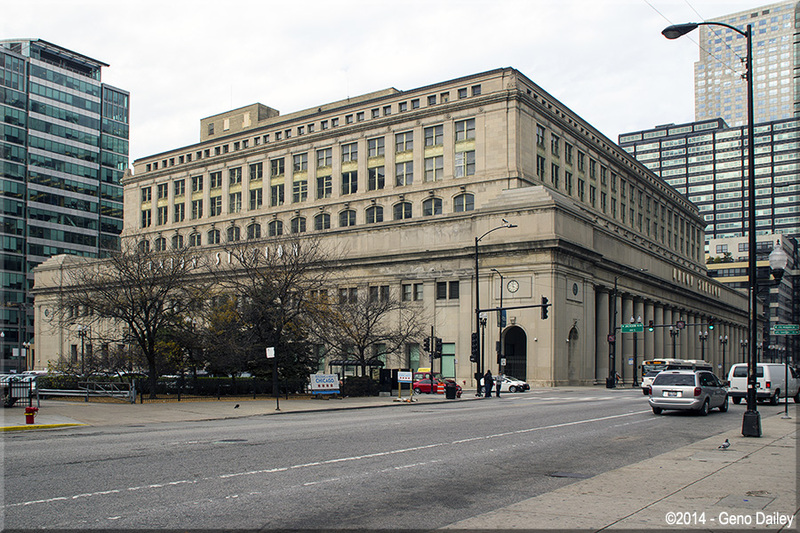 Beautiful Chicago Union Station, this view from Canal Street was taken as I was walking back there from Roosevelt Road.